Powers/Abilities: Thordis possesses superhuman strength (Class 100), stamina, vitality and resistance to harm. With Mjolnir, she can channel lightning, fly through the air, and change form from her normal mortal guise to her immortal guise and back again. As Jane Foster, she has exceptional skills as a nurse. History : (What If I#10) - Jane Foster was a nurse who worked with Doctor Donald Blake in New York City. She was very much in love with him, but he felt unworthy of her because he was lame. She followed him to Norway on a vacation where they witnessed a landing of the extra-terrestrial Kronan race. She and Blake fled for safety, but she stumbled into a ravine and got trapped in the caves there while trying to hide. She tried to use a piece of wood left alone in the cave to free herself, but then struck the wall with it out of frustration. 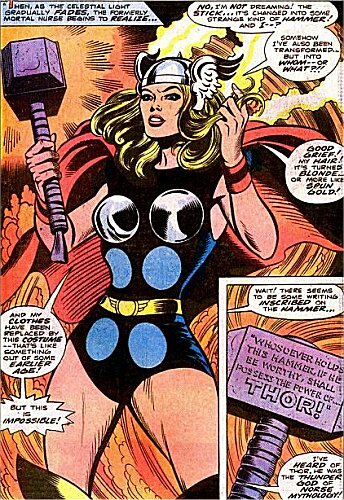 Bombarded with the mystical energies stored in the wood, she became charged with the godly power of the Norse thunder god Thor and the stick returned to its normal appearance as his hammer Mjolnir. Calling herself Thordis, she saved Blake and drove the Kronans from Earth. She used her alter-ego to come to the rescue of others, battled superhuman criminals and eventually founded the Avengers. Eventually, Loki, the foe of the true Thor, freed himself from his eternity-long imprisonment within a tree and renewed his enmity with the thunder-god, but was delighted to find that someone else had recovered Mjolnir. He tried to seduce Thordis into surrendering the hammer, but she proved to be still more than a match for him. She returned Loki to Asgard with Mjolnir, but the sight of its return compelled Thor�s father Odin to request his son�s return home. Foster responded to the call as Thordis, but once Odin realized that he had made a mistake leaving Mjolnir to be found by a mortal, he became so offended he cast her out of Asgard and back to Earth. Sif, Thor�s true love, was in attendance as this occurred. She ascended to Earth in secret and found Thor in his mortal guise of Don Blake that Odin had created years ago. She cured him of his lameness and resumed their romance without telling him he was the true Thor. Loki, however, refused to allow her to reawaken those memories of his true identity and went to kill Blake as Thordis came to the rescue and stopped him. The alien entity known as Mangog, however, invaded Asgard and nearly caused Ragnarok. Thordis, Sif and Blake fought valiantly in his defeat as Blake proved his bravery to reclaim Mjolnir and his true identity. Jane Foster was stripped of her guise as Thordis but remained a true goddess without Thor�s hammer while she stayed close to Odin�s side in Asgard. These events diverge from Journey Into Mystery#83. It can be assumed that once Thor regained his identity (around Thor I#154) that the rest of the timeline continued nearly identically to that of mainstream Earth-616. However, it could be assumed that at least any alteration caused by Foster as Thordis diverged more incidents that carried this reality to no longer have anything in common with the lives of its mainstream counterparts. 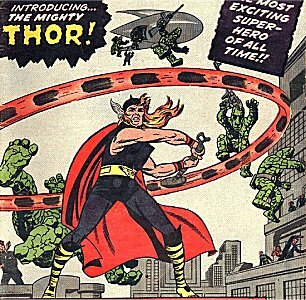 Later issues of Thor subsequently revealed that Donald Blake was simply a fa�ade created by Odin to teach Thor humility. These facts have no effect on this storyline which if anything actually ascertains many of those details before the fact. 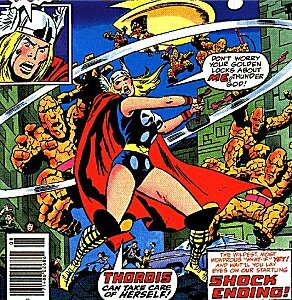 The concept of Jane Foster using Mjolnir to become Thordis and Mary Jane Watson using a sword to become Red Sonya that same year in Marvel Team Up I#79 both predate Adora using a sword to become She-Ra by almost ten years!